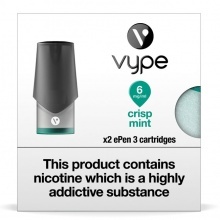 Providing you with an intense and satisfying vaping experience, the Vype ePen 3 Refill Cartridges are an easy and efficient way to make the most of your Vype ePen 3. We offer a full range of flavours and strengths for you to choose from, allowing you to find your perfect vape! If you would like more information about your Vype ePen or about the range in general, please get in touch with us at helpdesk@healthandcare.co.uk or on 020 7720 2266.